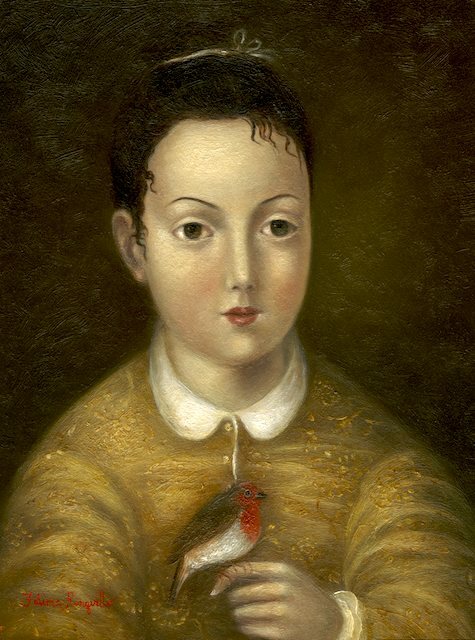 The paintings of Fatima Ronquillo, whose solo exhibition Wondrous Journey opened at Meyer East Gallery on Oct. 15, blend past and present, young and old in beguiling works that may invite the viewer to imagine narratives for them. Most of her portraits are filled with symbolic gestures. Some contain odd, often humorous pairings of humans and animals, and they are all painted against pastoral backgrounds that evoke different periods of historic painting traditions. Ronquillo references specific painting styles in her work, including the styles of Italian Renaissance artists such as Giorgione and later neoclassical styles in which posed figures are placed in idyllic landscapes,but she does so with subtlety. ‘I like Titian and the Venetian painters a lot,’ she said. ‘Mostly I like that idealized figure with rounded limbs. In general, I guess I’m obsessed with a certain figure.’ In addition to the way she renders her subjects, Ronquillo also captures qualities of older painting traditions in the colors she uses in her palette, which are mostly muted earth tones. 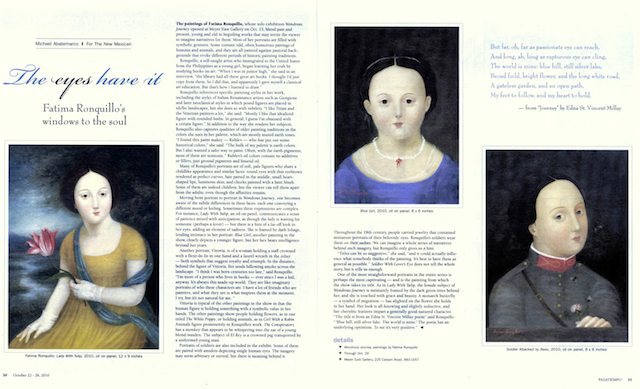 ‘I found this paint maker-Rublev-who has put out some historical colors,’ she said. ‘The bulk of my palette is earth colors. But I also wanted a safer way to paint. Often, with the earth pigments, most of them are nontoxic.’ Rublev’s colors contain no additives or fillers, just ground pigments and linseed oil. 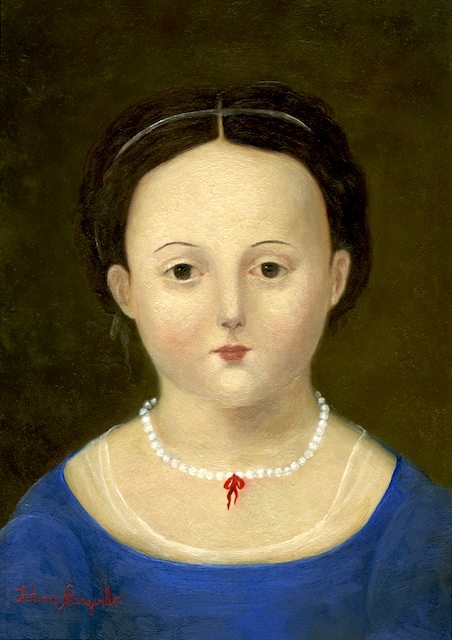 Many of Ronquillo’s portraits are of soft, pale figures who share a childlike appearance and similar faces: round eyes with thin eyebrows rendered as perfect curves, hair parted in the middle, small heart-shaped lips, luminous skin, and cheeks painted with a faint blush. Some of them are indeed children, but the viewer can tell them apart from the adults, even though the affinities remain. Moving from portrait to portrait in Wondrous Journey, one becomes aware of the subtle differences in these faces: each one conveying a different mood or feeling. Sometimes these expressions are complex. 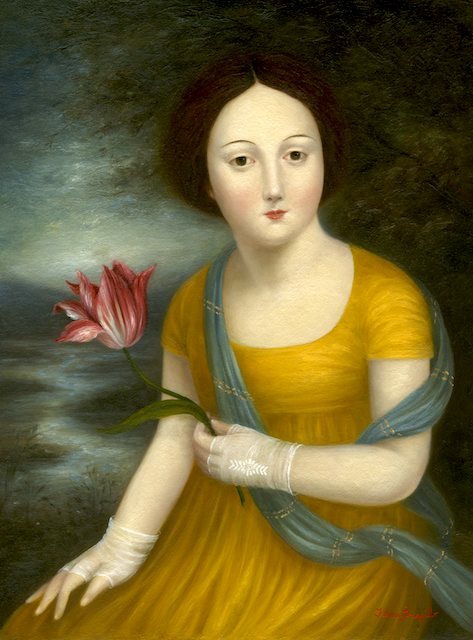 For instance, Lady with a Tulip, an oil on panel, communicates a sense of patience mixed with anticipation, as though the lady is waiting for someone (perhaps a lover) – but there is a hint of a far-off look in her eyes, adding an element of sadness. She is framed by dark foliage, lending intimacy to her portrait. Blue Girl, another painting in the show, clearly depicts a younger figure, but her face bears intelligence beyond her years. 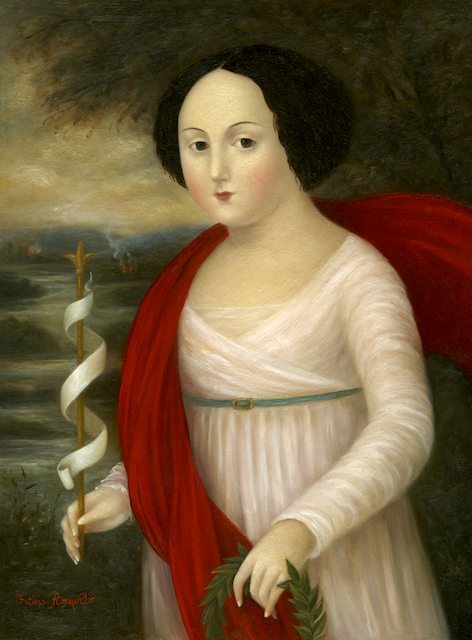 Vittoria is typical of the other paintings in the show in that the human figure is holding something with a symbolic value in her hands. 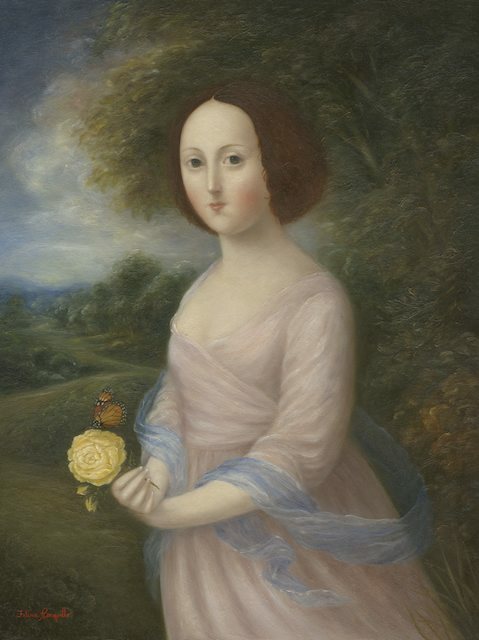 The other paintings show people holding flowers, as in one titled The White Poppy, or animals, as in Girl with a Robin. Animals figure prominently in Ronquillo’s work. 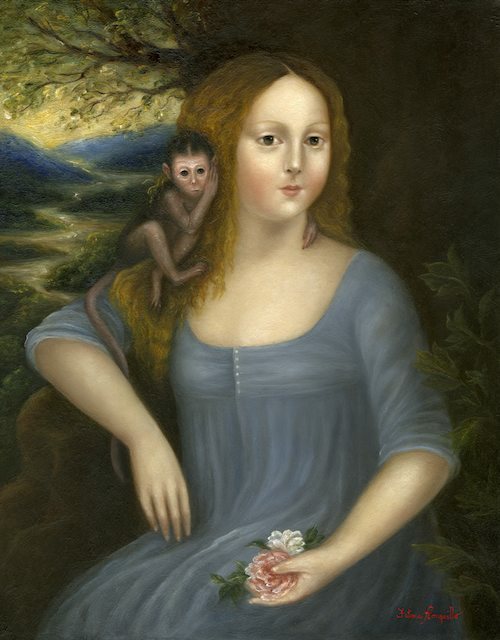 The Conspirators has a monkey that appears to be whispering into the ear of a young blond maiden. 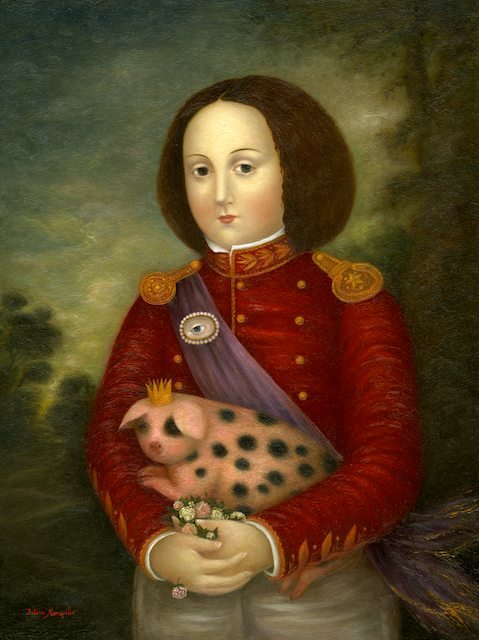 the subject of El Rey is a crowned pig transported by a uniformed young man. Portraits of soldiers are also included in the exhibit. Some of them are paired with amulets depicting single human eyes. The imagery may seem arbitrary or surreal, but there’s meaning behind it. 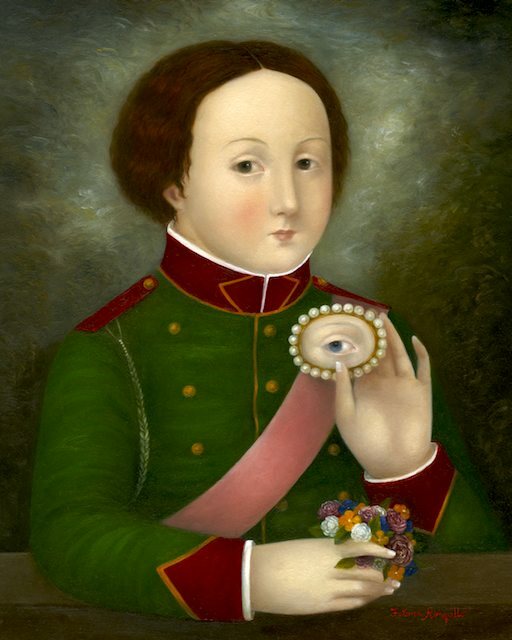 Throughout the 19th century, people carried jewelry that contained miniature protraits of their beloveds’ eyes. Ronquillo’s soldiers wear them on their sashes. We can imagine a whole series of narratives behind such imagery, but Ronquillo only gives us a hint. ‘Titles can be so suggestive,’ she said, ‘and it could actually influence what somebody thinks of a painting. It’s best to have them as general as possible.’ Soldier with Lover’s Eye does not tell the whole story, but it tells enough.